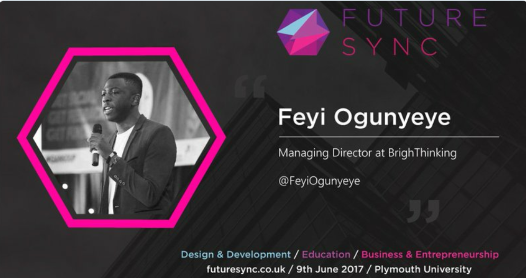 Feyi, Managing Director at Formation Zone client BrighThinking, has been invited to speak at Future Sync on 9 June. Feyi will be talking about his experience of being an entrepreneur while studying here at Plymouth University. While studying Business Management, Feyi has started his business BrighThinking, based in Formation Zone, and launched two new products. BrighThinking apply bright and sustainable ideas to products for a brighter future, hoping to begin changing the way that simple gadgets are manufactured and sold. Find out more about their innovative products, the SolarDock and EcoStand, on the BrighThinking website.